CHOCOLATE RICE CEREAL BARS – What’s Life Without A Little Treat?! I know it can be a little confusing. One minute I’m touting soups for lunch to help keep the weight down, the next I’m tempting you with chocolate desserts. But, hear me out! No one says you can’t have the fattening foods you love! You can. I, for one, HAVE to have dessert everyday. If I don’t, I feel deprived and it’s all I can think about. Then, in the vain attempt to fill the void an absent chocolate chip cookie leaves, I start eating pretzel sticks – lots of them. Or raisins, followed by pretzel sticks. I think you see where I’m going. I end up eating more calories trying to avoid eating calories. The key, of course, is portion control. We dessert lovers have to find a method to outsmart our sneaky ways. What sneaky ways, you ask? Let me paint a picture: You make a pan of brownies. You decide to store them in the baking pan so you don’t have to dirty a Tupperware. And you also decide not to pre-slice them so everyone can cut out the size brownie they want. You cut yourself a piece that’s about 1½” square – a reasonable size, right? But, gee – another ½” would just hit the spot. Oh, no! That last slice was not quite straight – let’s just fix that up (brownies should be at 90º angles, shouldn’t they?). But now the rest of the row is too big for one person, but not enough for two – might as well fix that, too. Whoops – you broke off a piece when you were removing that last bit. No one’s going to want that. Pretty soon you’ve rationalized eating the entire row. I’ve been around this earth long enough to get to know myself. As stated previously, I need my dessert everyday. I just do. BUT, I’m also very vain and have always prided myself on my slim physique. It never came easy, but I always managed to keep my weight stable. Unfortunately, as time went on it got harder and harder. Before I knew it I was wearing nearly 10 extra pounds. That’s 2 sacks of flour! Something needed to be done. Besides being vain and needing dessert everyday, I’m also basically lazy. So instead of cupcakes I’d make a layer cake, instead of muffins I’d make a loaf, instead of individual pudding cups I’d make a large bowl, and so on. The problem was I always knew there was more when I took my serving. If I cut a ½” slice of cake, it was kind of flimsy, and I felt like I was short-changing myself. So I’d go back for a wee bit more. BUT, if I have a cupcake I feel complete – even though if you cut a cupcake in half and place one half on top of the other it becomes a VERY thin slice of cake. Crazy! The mind is a funny thing. I guess when I grab a cupcake (or pudding cup, or pre-cut cookie bar) I know this is my dessert. But when face to face with a whole dessert, I can take as much as I want. And that’s where will power comes into play…..or doesn’t. Sigh! So now I either make individual portions (such as cupcakes or pudding cups), or I pre-cut the dessert and remove them to a storage container. I’ve found if I leave it in the baking pan – even if I pre-cut – I’m tempted to cut off a little more. This brings me to the No Bake Chocolate Rice Cereal Bars pictured above. The last time I made them I left them in the pan and didn’t pre-slice. I think I polished them off in 3 days BY MYSELF. I made my latest batch 6 days ago. There are still 2 left and I’ve had my husband and son to help me eat them. So, ladies and gentlemen – PORTION CONTROL! It works for me. Melt together the chocolate chips, butter, and corn syrup in a large pot over a low/medium flame. Stir often so it doesn’t burn. Add in the powdered sugar and vanilla and mix until blended. Turn off burner. Pour in the rice cereal and stir gently stir (you don’t want to crush them) until well coated. Pour into any size pan you want, depending on how thick you want you bars to be. If you want to make individual cookies, you can drop blobs onto waxed paper. Either way, put them in the refrigerator to set. You may want to store them in the fridge, depending on how hot it is in your house. NOTE: I line my pan with waxed paper – that way I can remove the entire slab and make nice clean cuts with a long knife. If you have trouble removing the bar with the waxed paper, hold the pan WEARING OVEN MITTS and quickly run it over the stove flame to slightly melt the bottom. It’ll come right out. Following the theme of this blogpost, cut the bars into whatever size pieces you want and store them in a covered container. 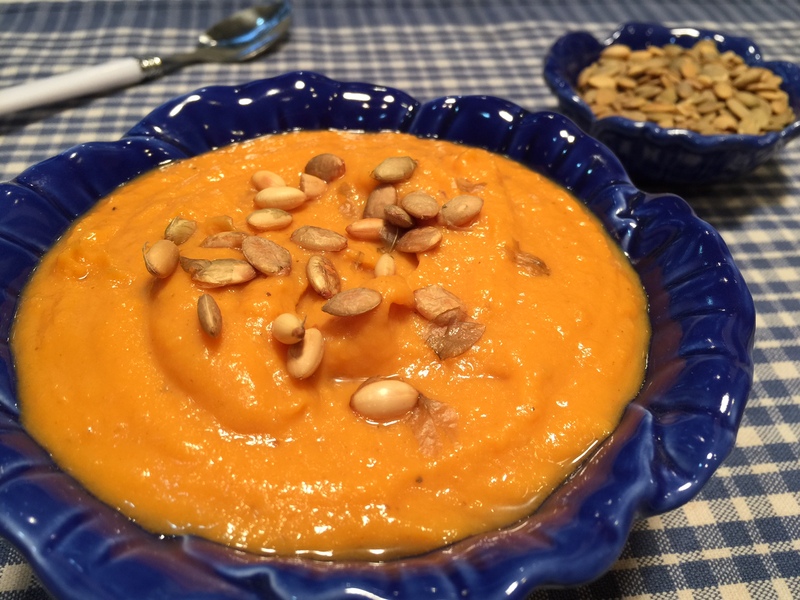 CREAMY SWEET POTATO SOUP – Without The Cream! Cream soup without the cream? What? How can this be? Oh – it be! Thanks to your handy-dandy blender. Wait – you say you don’t have a blender?! As many of you know, I don’t like to throw money away on frivolous things (cheap!). There are many kitchen gadgets that are one trick ponies – you can only use them for one thing (such as a bread maker). I’m not a fan. BUT, I do believe in stocking your kitchen with tools that will ease the task of cooking, thus making it more likely you WILL actually cook. Items such as a food processor, toaster oven, a wide assortment of pots, and a BLENDER! Please note, that I put food processor AND blender on the list. That’s because they are both useful in different ways. The food processor is great for shredding carrots & cheese, chopping tomatoes and onions, kneading dough, finely grinding nuts. The blender uses a funnel action and is great for puréeing soups, pesto, and yogurt shakes. By the way, you can find these items at thrift shops if you’re on a tight budget. A couple of weeks ago I wrote a blog about eating soup for lunch (click on Slim Down With Vegetable Soup) to help lose those extra pounds one accumulates during the winter months and (let’s be honest) just plain life. I based the idea on that old Campbell’s Soup commercial where the girl wanted to fit into her itsy bitsy bikini so she replaced her calorie laden lunch with soup. I decided to add another soup to the list: Creamy Sweet Potato Soup. Which brings us back to the blender. (See how I did that? I returned us seamlessly to the beginning of the blog.) Did you know if you purée soup in a blender it gets creamy, even if there’s no cream in it? It makes you feel like you’re indulging in something decadent when, in reality, it’s low in calories. Plus, soup fills you up pretty quickly which satisfies you long enough to get you away from the table. The last time I was in London, I had a wonderful Sweet Potato Soup made with coconut milk and coriander. It was a lovely blend of flavors. I decided to try to duplicate the essence while ditching a lot of the calories. Also, to make sure it met vegetarian criteria (this is a vegetarian blog, as you know), I used vegetable stock in lieu of the suspected chicken broth. So I started throwing ingredients together until I came up with a taste I was happy with. (OR, ‘of which I was happy’, for you English majors). A little tip for those of you who like to either create your own recipes or just tweak other peoples’: write down the ingredients and the amounts you use. Then make notes about the taste and possible suggestions for future attempts. You don’t have to write a novel – just a quick, ‘try oregano instead of basil next time’. I’m a firm believer in not reinventing the wheel. When you find something that works (or doesn’t) keep track. That way you’ll save yourself time in the future AND be able to make it again. No matter how good your memory is, over time one forgets minutia such as ‘was it 1 cup or 1½?’ or ‘did I use garlic SALT or POWDER?’. Once you write it down, it frees your mind and you don’t have to worry about it again. As far as the coconut milk goes, you can use either canned or powdered. Canned is more accessible in my town, but I prefer the powdered so I just order it online. If you use the canned, you’ll need to decrease the amount of vegetable stock since there’s water in it already. By using the powdered, I can play around with how much coconut goes in the soup. Also, I can half the recipe and don’t have to worry about what to do with the unused half. Plus the powder takes up less cupboard space. But, at the end of the day, it doesn’t really matter as far as taste is concerned which you choose. Heat the olive oil in a very large stockpot and sauté the onions about 5 minutes – until they begin to brown. Add in the cumin, coriander, ginger, bay leaf, salt, and pepper. Stir for another minute to bring out the flavors. Pour in the sweet potatoes, coconut powder, and vegetable stock. If you’d like to make your own stock (which I ALWAYS do), you can find my recipe by clicking on BACK TO BASIC: VEGETABLE STOCK. Bring to a boil, then cover and simmer until the sweet potatoes are tender – about 20-30 minutes. Let the soup cool down a bit, REMOVE THE BAY LEAF (notice the caps – this is important! ), then pour into your blender (in batches, if need be) and purée. Serve either hot or cold. NOTE: Toasted pumpkin seeds are a tasty topping – and they’re visually appealing. If you’re in a hurry (and who isn’t?! ), you can make this soup even faster by skipping the sauteing onions part and just throwing everything into the stockpot. I’ve done this many times, and the soup is still excellent. 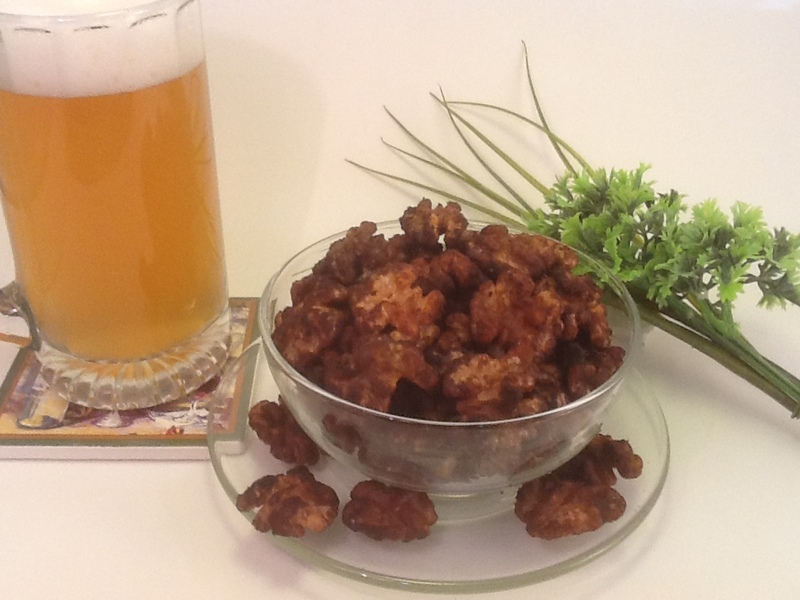 Spicy Walnuts – Score A Twofer! Who doesn’t love a bargain?! Twofer, BOGO (buy one, get one free) – such a deal. I make no secret of the fact that I am quite fond of making my money stretch (yes, I’m cheap!). That’s one of the reasons I like to make things from scratch. Every time you buy a convenience food (shredded cheese, bagged lettuce, jarred spaghetti sauce), there’s a price to pay. Along this same line, I’m ecstatic (Yes, ecstatic – I’m an actress. I’m overly dramatic!) when a food I make can be used more than once – and I’m not talking leftovers. I mean you make a dish, change it up a bit, and voilà – a brand new dish. I would now like to introduce to you my Spicy Walnuts recipe. When you use walnut halves you have a snack food to set out in a bowl at parties or to chomp on watching TV. When you chop the halves into 4 or 5 pieces, you have a tasty add-in to salads and casseroles. As the name implies (SPICY Walnuts), they have a kick to them. If it’s too much for you, ease off on the cayenne pepper. Also, since this is a vegetarian blog, I’m recommending vegetarian Worcestershire sauce – there are several brands. Spicy Walnuts are easy to make, but they do take about 20 minutes to bake. NOTE: You aren’t obligated to use walnuts. Try almonds, peanuts, cashews – whatever you fancy! For you visual learners (or those just curious to see me in action), click on SPICY WALNUTS and I’ll show you how to make them. Heat oven to 350º Fahrenheit. It takes a total of 16-25 minutes for the walnuts to brown, stirring every 5 minutes. Please heed this advice: set 2 timers! One for the total of 20 minutes, and one to set every 5 minutes. Five minutes is just enough time to find one ‘quick’ thing to do. Either this thing ends up taking longer than expected, OR we find another ‘quick’ thing to do and suddenly it’s 10 minutes later. I think you get my point. It’s important to stir them every 5 minutes so they brown evenly. It’s worth noting, I use a dark jelly roll pan. Dark pans cook things faster, so my Spicy Walnuts took 17 minutes. That’s why I put a wide cooking range (16-25 minutes). The cooking time will vary depending on your oven and the type of baking pan you use. You want the nuts browned and crispy, but not blackened. WARNING: These Spicy Walnuts are very addictive. Like the old Lays Potato Chip advert – I bet you can’t eat just one! For those of us in the Northern Hemisphere, the sun is making its clothes-shedding presence known. Spring is melting into summer and bulky sweaters are being replaced by sleeveless tops. Goodbye bulge hiding parkas; hello bathing suits. It’s about this time of the year we start to regret not keeping up with that annual New Year’s resolution we make every January 1st. You know the one – to get into better shape by eating healthier and exercising more. Oh, the best laid plans. Well, it’s never too late! Years ago there was a Campbell’s Soup commercial showing a young woman whose goal in life was to fit into her itsy bitsy teeny weeny yellow polka dot bikini. She devised a plan to eat Campbell’s Soup for lunch instead of her presumably usual calorie laden meal. She also had said bikini hanging on her wall for inspiration. I’ve never forgotten that commercial – not only because they had that fun yellow polka dot bikini song playing throughout, but because the premise made sense. It’s been proven that it takes about 20 minutes for the brain to figure out that the stomach is full. This is why diet experts always tell us to eat slowly. 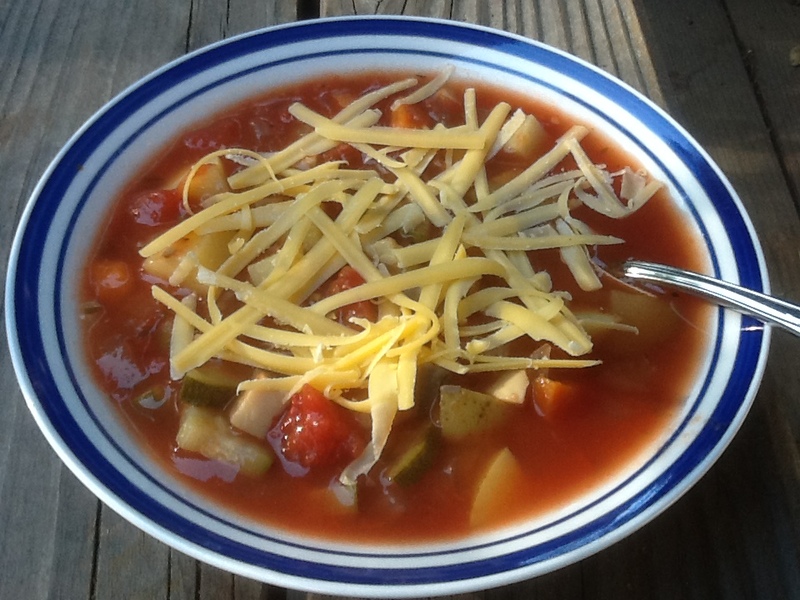 What’s so great about soup is that because of its high water content it fills us up quickly. Of course, because of it’s high water content, we get hungry again sooner. But, at least, the soup got us away from the table unscathed. With a little planning we can have a low calorie snack (such as another bowl of soup, a banana, or some yogurt) mid-afternoon to tide us over until dinner. Of course, if you have a soup made with cream and/or butter, you’re defeating the purpose. I’ve been making a vegetable soup that’s super easy (just throw everything into the pot) and varies depending on which veggies I have on hand or feel like buying. Sometimes, when I’m in a decadent mood, I even sprinkle on a little shredded cheese – just for the protein, of course. It’s also a great way to get those daily servings of vegetables – especially for the kids. For some reason they seem to eat them in soup. Clean and prepare all veggies. Throw everything into a large pot and bring to a boil. Cover and turn down heat. Simmer until vegetables are cooked – I always judge by the carrots. EASY!!! The nice thing about making your own soup (sorry Campbell’s) is that it’s so much cheaper and you can tailor it to suit your taste. Also it’s a great way to use up those leftover veggies that you just can’t bring yourself to throw out. Apologies to those of you who now have the itsy bitsy bikini song running in your head!